In the run up to World War II, German secret societies and the Nazi SS were guided to three large caverns in Antarctica by Reptilian extraterrestrials, according to former U.S. Navy intelligence operative William Tompkins.In interview, released in 2016, Tompkins describes how the Reptilians helped the Germans/Nazis build underground bases in remote Antarctic caverns, which were located next to even larger caverns controlled by the Reptilians. According to Tompkins, the U.S. Navy learned of the existence of these secret Antarctic bases from their spies embedded in Nazi Germany, who found that the Nazis/Germans used these remote bases to launch space missions to the Moon, other planets in our solar system, and, most remarkably, to distant interstellar locations. Tompkins says that the Germans began moving equipment and supplies to Antarctica as early as 1913, which coincides historically with the Second German Antarctic Expedition from 1911-1913. This period also coincides with the increasing role of German secret societies in exploring remote global locations for occult knowledge. The move from Germany to Antarctica was in operation from 1934 way before the war started. In fact some of the stuff went down in 1913. Large portions of equipment were sent down there. But right next to them were three tremendous size caverns which the Reptilians had. Not Grays, but Reptilians. Germany got two more, about a tenth the size of the big Reptilians [cavern]. They were able to … [go] down, usually by submarine. They built these flat submarines, these regular class, so they could ship all this stuff down. … the German submarine fleet is proud of having built for the Führer, in another part of the world, a Shangri-La on land, an impregnable fortress. The German Navy will have to accomplish a great task in the future. The German Navy knows all hiding places in the oceans and therefore it will be very easy to bring the Führer to a safe place should the necessity arise and in which he will have the opportunity to work out his final plans. Donitz’s remarks were made plausible in 1966 by cartographer and artist Heinrich C. Berann for the National Geographic Society. 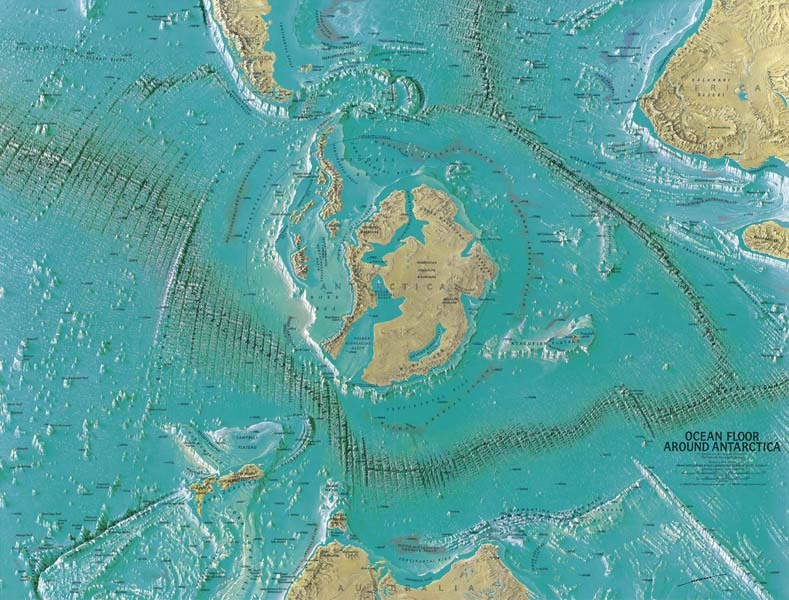 In Berann’s depiction of an ice-free Antarctica, he shows underwater passageways that run throughout the Antarctic continent. This provided a plausible way in which submarines could travel under the ice for considerable distances to Nazi Germany’s “invulnerable fortress”. Donitz’s claims are further supported by documents provided by an alleged German submarine crewman after the war, which described the instructions for U-Boat Captains to reach the Antarctica bases through the hidden passage ways. Below is an image of the document with the translated instructions. They built the prototypes in Germany. They built pre-protype, something which is ready for production, in Antarctica. They put this stuff in production in the countries all over Germany [Occupied Europe], and they continued to build similar vehicles in Antarctica. Tompkins then shares one of the most astonishing secrets gained by the Navy spies embedded in Germany. With the help of the Reptilians, the Nazi’s Antarctica program had successfully launched manned missions to the Moon, planets, and even other star systems. Now the question was asked whether did we ever get to the Moon? You see it was in some way, it was well known that the Germans had a number of vehicles that flew out and came back. One of the first ones, they got into trouble, they crashed and the whole group died. But that was almost all coming from Antarctica. Way before, four years before, the war ended, they were always moving all of this stuff out. And so the flights, almost everything came from Antarctica with the same people. … I don’t know if it was true or not, but it was stated by some of those fellows [Navy spies] that they had gone to other stars and come back. Tompkins remarkable claims corroborate the testimony of secret space program whistleblower, Corey Goode, who claims that from 1987 to 2007, he had access to smart glass pads, which described the successful Nazi space program that operated out of Antarctica. As explained, the Nazi remnants that were made up mostly of Secret Societies that created a “Break Away Civilization,” kept the most advanced technology secret from even their highest Military and Political leaders, setup enclaves in South America and Antarctica. The locations in Antarctica were some ancient civilization ruins that had remained occupied by certain groups in thermal area’s that cause area’s similar to lava tubes and domes under the glaciers. What makes Tompkins claims difficult to dismiss are documents he has published in his book, Selected by Extraterrestrials, supporting his main claim that he participated in a covert Navy Intelligence program that disseminated Germany’s advanced aerospace secrets to selected U.S. aerospace companies, think tanks and universities. Furthermore, documents, and statements by Admiral Donitz, support Tompkins claims that Nazi Germany had succeeded in locating and building underground facilities under the Antarctic continent. The long route under the Antarctic ice sheets, which the German submarine fleet allegedly took to reach these hidden caverns, gives credence to Tompkins claims that Reptilian extraterrestrials had provided the Nazis with the information necessary to locate the hidden Antarctic caverns, and the under-ice passage ways to reach them.